READ THE OFFICIAL ANNOUNCEMENT & RULES, and WATCH THE VIDEO HERE ! I’m Phired Up for the #SummerRecruitmentChallenge . Summer is here! Students have certainly earned their summer break, balancing their school work, campus involvement and personal relationships for the past nine months. Now that the spring semester has come to a close, it’s time to focus on recruitment during the summer. However, for most college students, it seems laughable to put the words “focus” and “summer” in the same sentence. That is why we created the #SummerRecruitmentChallenge . What motivates people? In particular, what motivates fraternity men? (“Not a damn thing!” answers the frustrated chapter president) We believe that competition, challenges and rewards for a job well done are motivation for college-aged fraternity men. 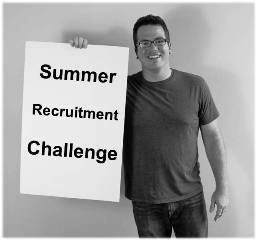 The #SummerRecruitmentChallenge will be a fun, exciting and beneficial 8-week summer long competition. Every fraternity chapter in the country is invited to participate. The focus will be on three key areas of summer recruitment. Putting names onto your names list. Hosting values based activities and events. Helping your university get students Phired Up for the fall semester. Each week, we will tweet out (@PhiredUp ) a weekly goal or challenge. The one chapter that best completes all weekly challenge for 8 weeks, will be awarded a Phired Up Recruitment Scholarship to be given to one of their new members in the fall. Let’s show the twitterverse what real fraternity men do during May, June and July! Let’s be the leading example of year-round-recruitment! And let’s build real relationships through summer recruitment and welcome thousands of men into the fraternity community this fall! For more information, READ THE OFFICIAL ANNOUNCEMENT & RULES, and WATCH THE VIDEO HERE !